Pasta, a humbly delicious creation made from a mixture of grain and eggs, or sometimes water, that has different versions in many different cultures cuisine’s. 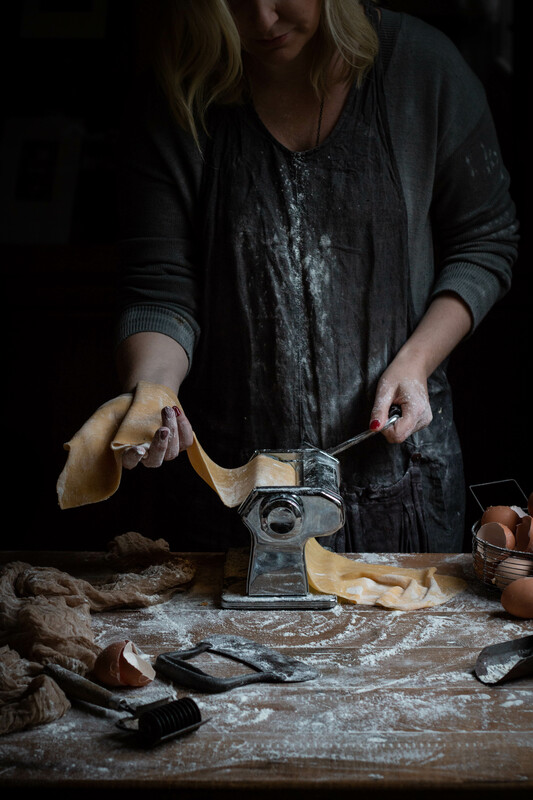 For this post I want to focus on Italian pasta, as trying to delve deeper into the actual origins of pasta proved so diverse, it was impossible to link it to just one country. 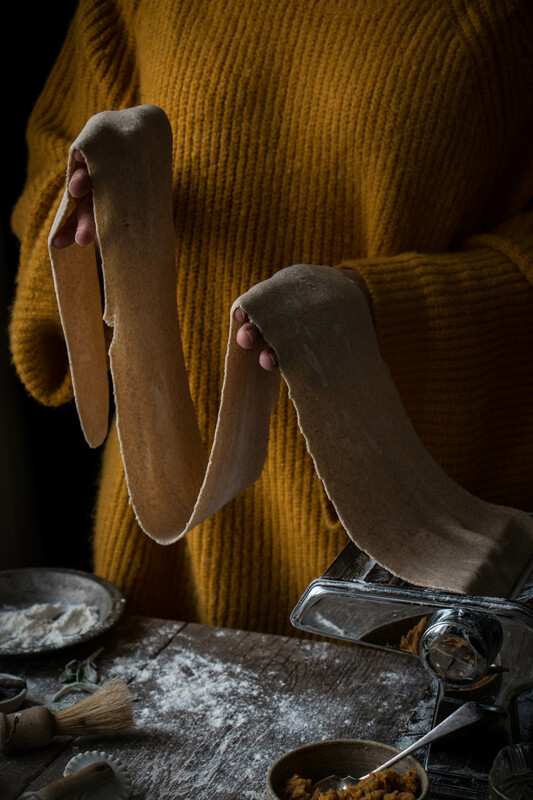 During my research for this post I read up on the history of pasta from one of the all-time greats Antonio Carluccio, and he said that “The Etruscans, a pre-roman civilisation in the Italian peninsula, are thought to have been one of the first to make pasta. Reliefs in the Tomba bella in the Cerveteri illustrate what looks like a pasta board, a rolling pin and a pasta wheel. But this proves nothing, as texts at this date suggest that any alimentary paste where more likely to have been baked than boiled”. There are so many varieties of pasta, generally dried or fresh and I am going to be discussing how to make fresh pasta at home. 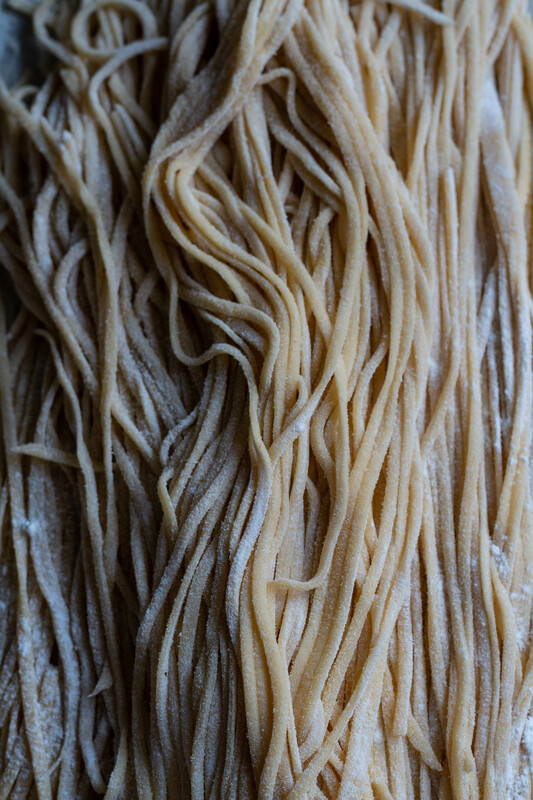 I find the process of making pasta so therapeutic and such a joy. It pains me when people say that they are too intimidated to try making it at home as they think its too hard. I would hate to think people are missing out on something that is actually a lot easier than it looks, so I hope this post will convince you how simple it is, and also how enjoyable it is to make. Fresh egg pasta seems to be the most common one to make at home, and its the one I make most often. Probably as I usually have eggs that need using up, but really its because pasta is always a good idea!. It is really easy to make your self. This one is great if it is your first time making it. Just the combination of two humble ingredients of eggs and flour create such a heavenly dish. 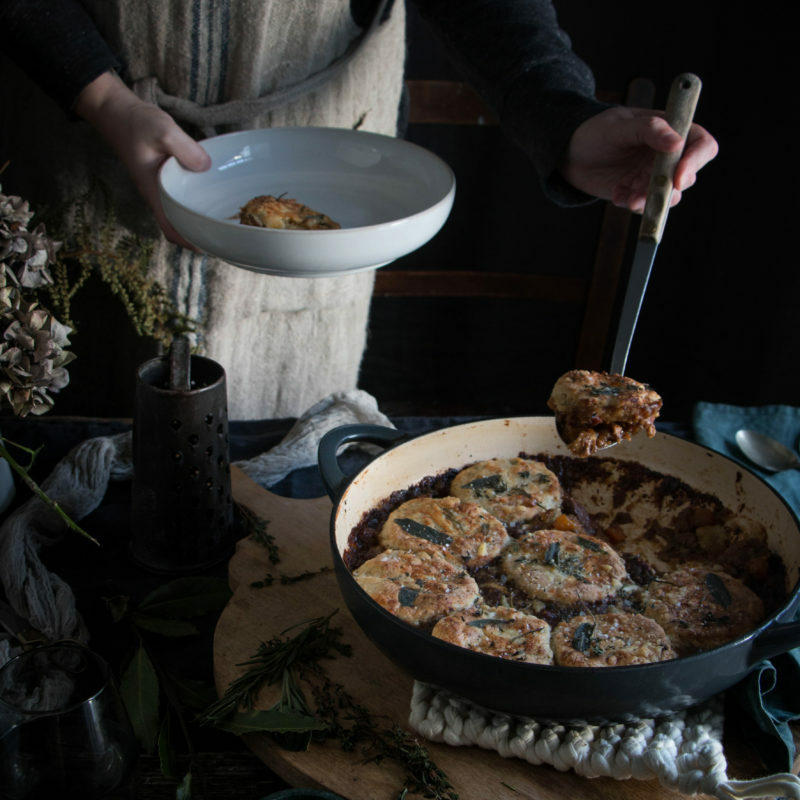 I love it when simple ingredients come together and make something so incredible. Its silky and delicious served with a variety of sauces. There are so many recipes for egg pasta flying around but generally the common thread is the use of Tippo 00 flour. But normal plain all purpose flour will suffice if you cant get tippo 00 flour. I have been told that the mixture of tippo 0 and tippo 00 flour is also common in Italy, but I’m not experienced with this flour combination, and tippo 0 flour is not as easy to find here in England. 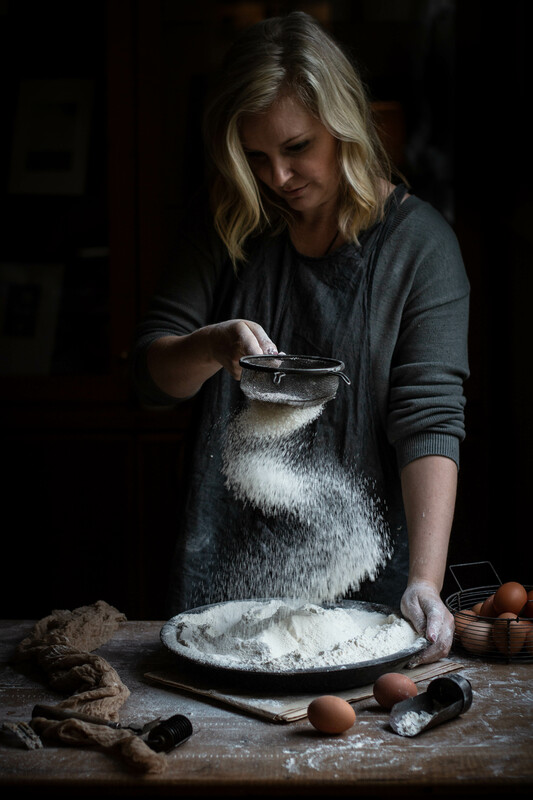 To make it, sift the flour on the table into a mound, and using your hands make a well in the centre so it is like a little volcano. Then crack the eggs into the centre and with a fork start mixing the eggs. Mix it until a paste is formed then start bringing in a bit of flour from around the edge a little at a time until its combined, then use your hands to mix the rest and knead it into a ball. You can add more flour if the dough is too sticky or a few drops of water if it’s too dry. If I’m being honest, I’m not that precious about making it by hand, I often use a food processor for that step on days when I’m in a rush. 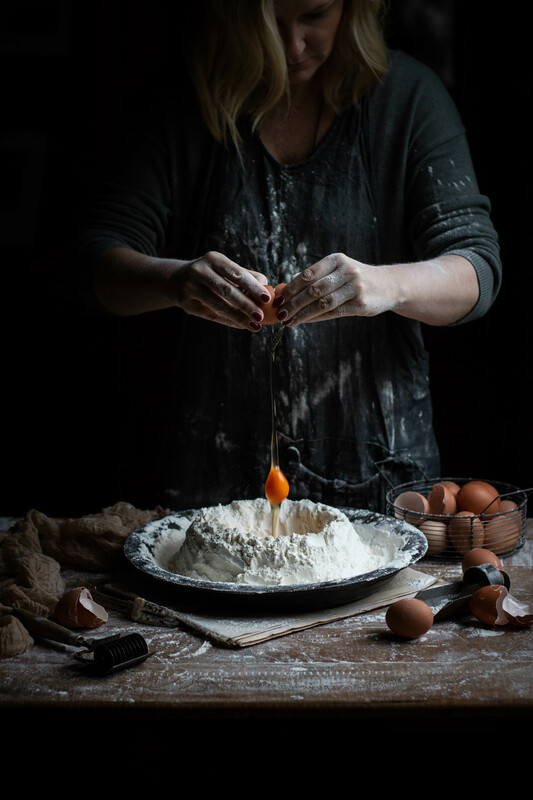 Just add the flour in a bowl of a food processor and add the eggs and pulse a few times until it comes together and then knead it. Knead the dough with clean dry hands using the heel of your hand, basically as you would with bread. Working the dough for about 10 minutes until it is smooth to touch and elastic. 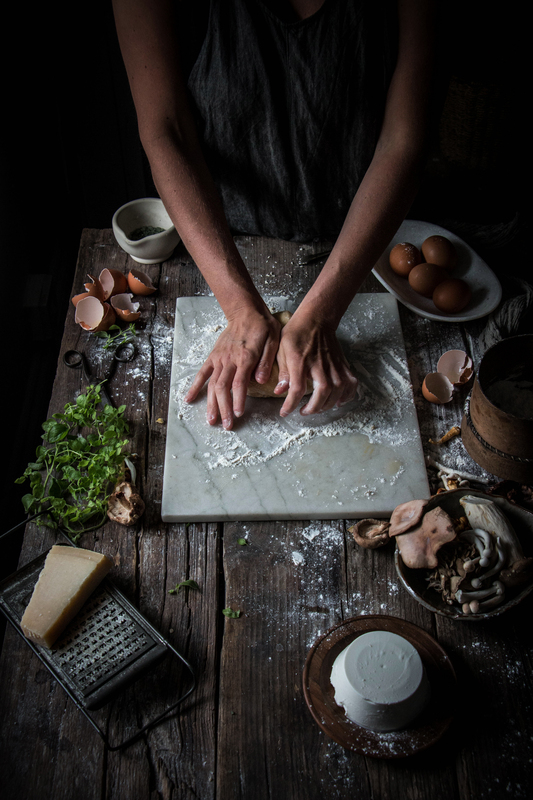 You can even knead it with the dough hook on your kitchen aid mixer if you are feeling really overwhelmed by the process of making it by hand, but I would suggest you try the hand mixed/kneaded method at least once or twice first so you can get used to how the pasta should look and feel. 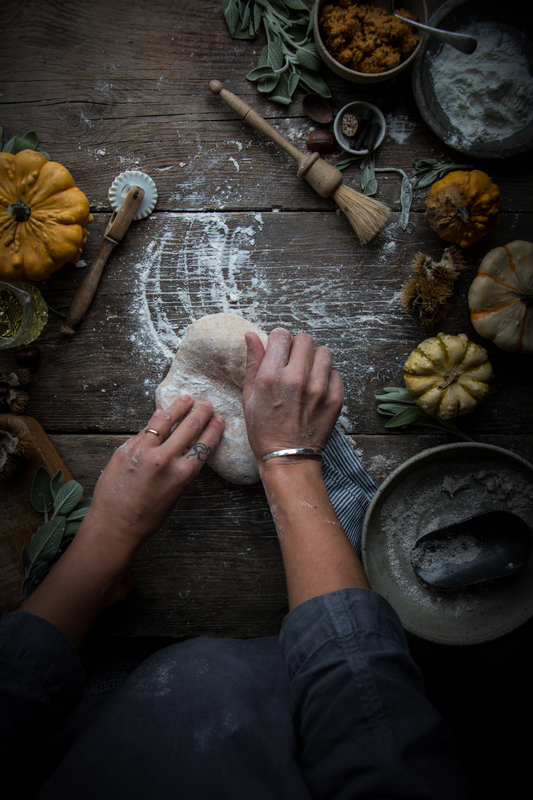 My tip for knowing when its ready, which was shown to me by a wonderful lady in Puglia is to hold out your hand flat and using your finger on the other hand press the palm of your hand just under you thumb. It feels springy and that is basically what your pasta should feel like. It needs to bounce back after being pressed. 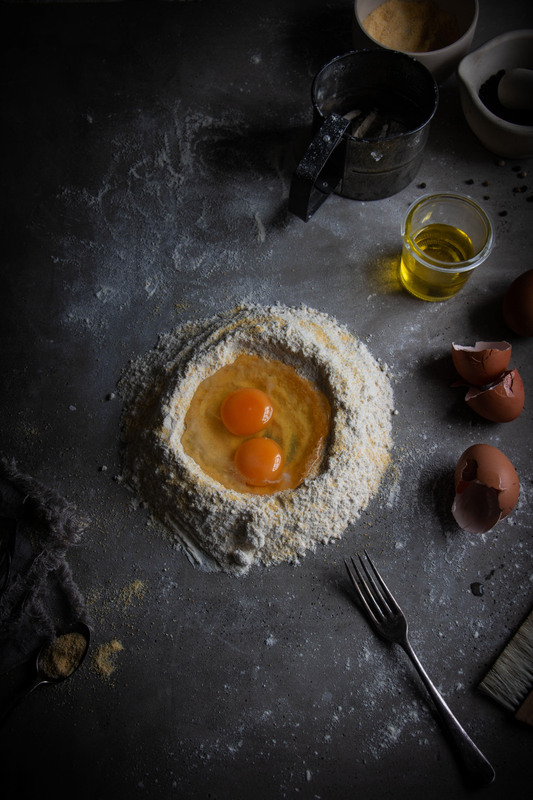 Because I make pasta so often, I find that I don’t need to weigh the ingredients out and I just tend do it by eye, I just make a mound of flour on the work surface and add a couple of eggs and then if I need too I then add more flour or beaten egg to it until I get a soft workable dough. 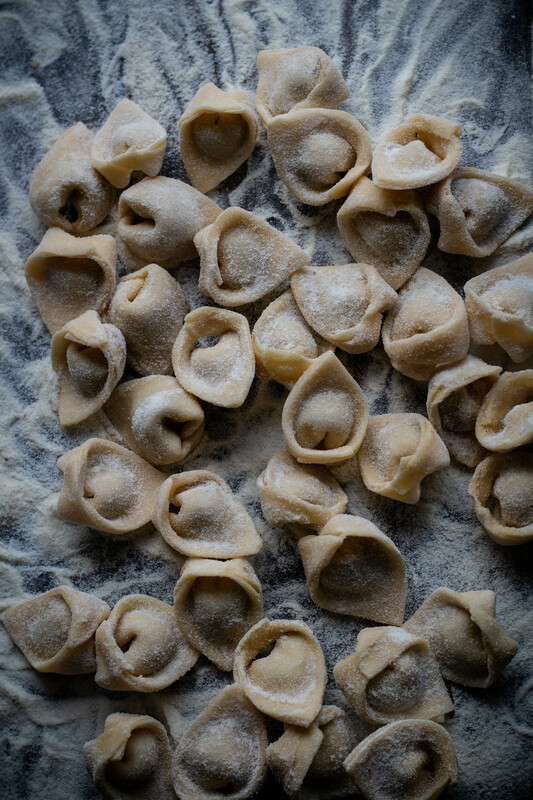 There doesn’t have to be an exact science with pasta, you just need the dough to be the right consistency. You can always add more flour or liquid to it. 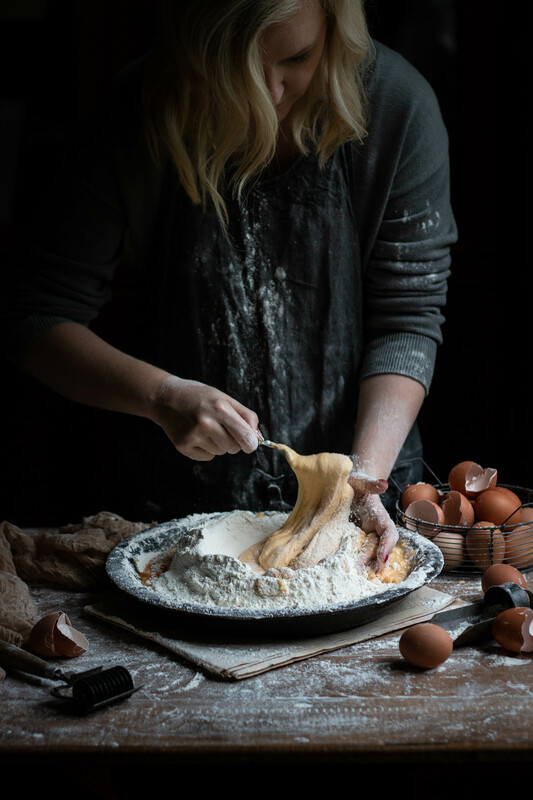 Because its just the two of us eating, I often make half the amount of dough stated for these recipes here, or I make a big batch and then freeze the extra pasta on a flat baking sheet covered over night. Once the pasta is frozen I tip it into a zip lock bag and keep it in the freezer until I need it and cook it from frozen. I find it freezes better once its shaped into pasta rather than just freezing the ball of pasta dough. Its also hard to give exact measurements as different brands of flour absorb liquid a little differently and egg sizes vary, But this is a good bench mark to start with. Rest your dough!! You just mixed two completely different ingredients together and kneaded it into submission, give it time to rest and let it figure out it now has a totally different structure then it did 10 minutes ago. Cover the dough in plastic wrap and leave to rest for at least half an hour. If you try to roll it straight away it will tear and not roll out smoothly. 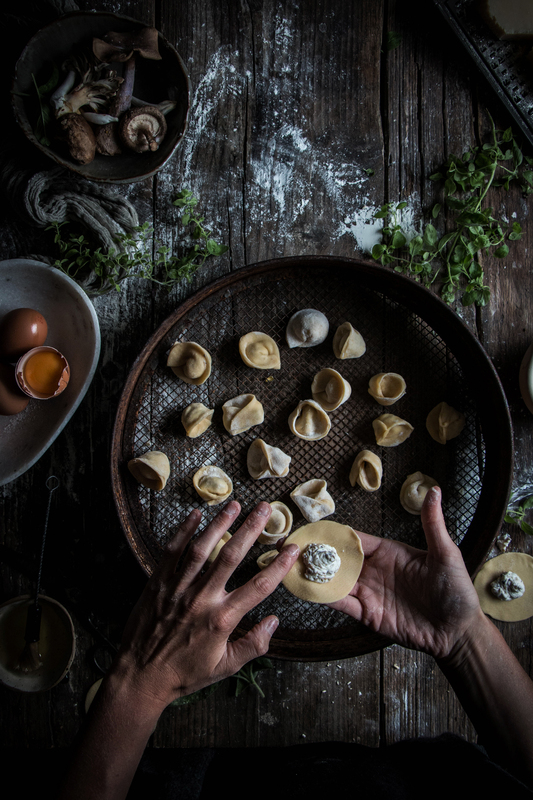 Now its time to shape your egg pasta and there are so many options here. Traditionally, it would have been rolled out with a very large rolling pin, and you can do it that way if you like, it just takes a lot of time, and a large area to work in. I prefer to use a pasta machine as my kitchen and workspaces are so small. You can buy pasta machines for a reasonable price now and they all pretty much do the same job so just pick one at a price point your happy with. Start with the machine on its widest setting, cut your ball of dough into four pieces. Cover the rest of the dough while you’re working so it doesn’t dry out. Press the dough flat with your hand and sprinkle it with flour so it doesn’t stick, then roll through the machine, take the dough and fold in half and then roll through the machine again, I then fold the dough again and roll through. I do this three times on the widest setting before I start to turn the width down to the next setting. This just ensures the dough will be silky smooth and an even width so its worth doing. Put the dough through the machine turning down the setting each time until you reach a beautifully thin dough. I tend to go down to number 7 on my pasta machine but different machine models vary (it is one or two above the thinnest setting that my machine goes too). I roll it Even thinner for filled pasta. 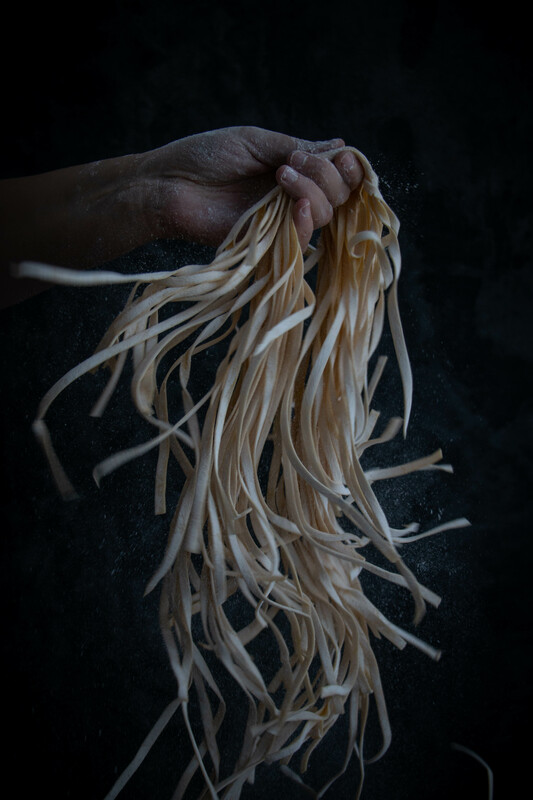 Long pastas consist of shapes like spaghetti, tagliatelle, chitarra cut pasta called spaghetti alla chitarra, pappardelle and fettucine and many many more. However these are the ones I generally tend to make at home my self. I love long pasta, but it never seems like a very ladylike pasta to eat, I usually end up spilling some down my top. I prefer the wider pastas like fettucine and tagliatelle over spaghetti, if I had to choose. But in all honesty there isn’t a pasta I wouldn’t eat. Pasta’s with more edges like the flat pastas hold the sauce better than a smooth pasta like spaghetti, so that might be why I prefer them. 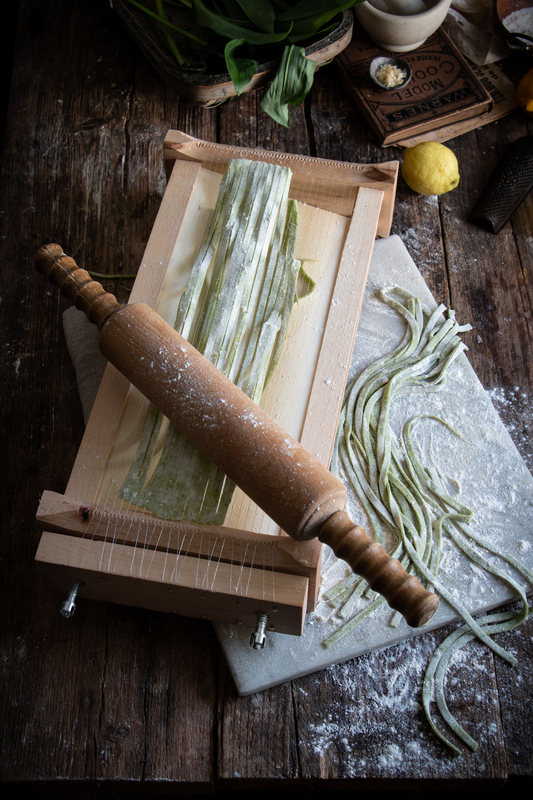 Spaghetti and tagliatelle alla chitarra are made with a chitarra cutter, whereby you place the rolled piece of dough on the strings and roll it with a rolling pin to cut it (see photo below). I also have several rolling pins with indentations that cut the pasta into several widths. You can find both on amazon. 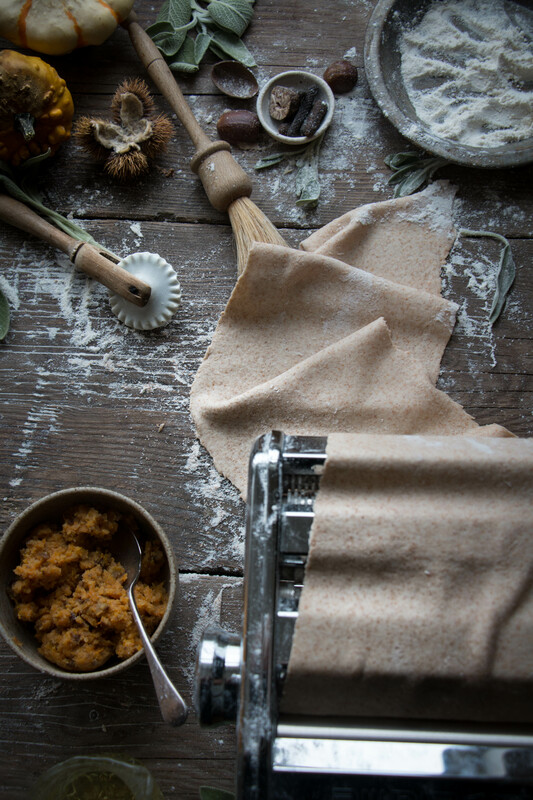 To make pappardelle, flour the rolled out dough well and then roll it up tightly into a log shape. Then cut strips using a sharp knife. I cut it into 2 cm wide strips. I normally dust my pasta with a mixture of semolina and tippo 00 flour so it doesn’t stick. 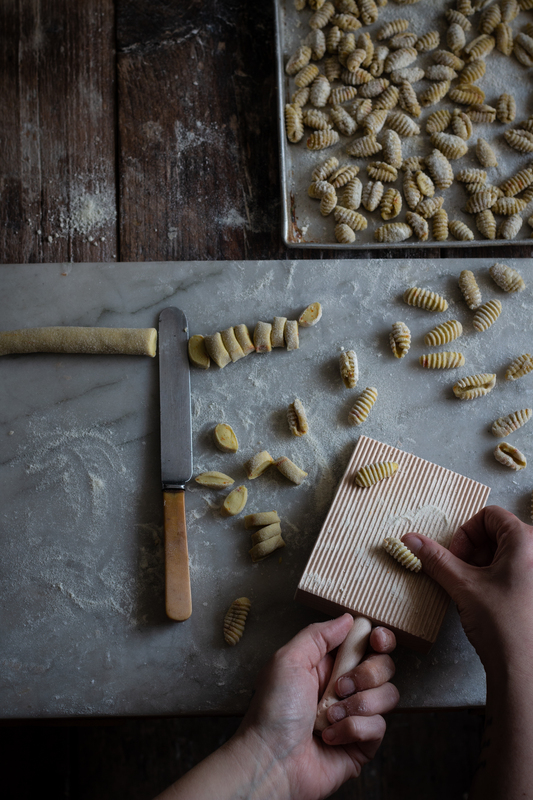 There are many hand fresh shaped pastas, but a lot of the ones I tend to make myself are made with the durum wheat semolina pasta (below) I use a lot of dried short pastas for home cooking. 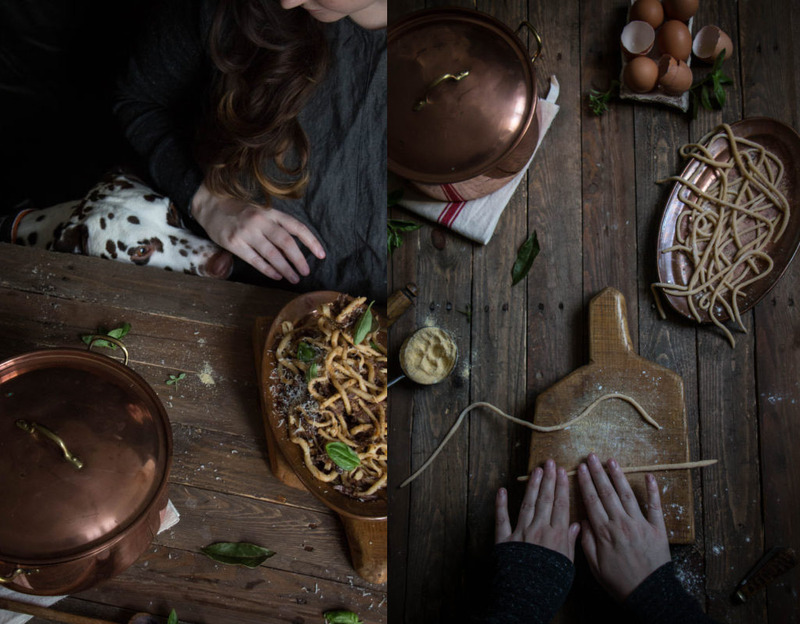 Fusilli – This can be made at home by using a knitting needle. Cut the pasta into squares, usually about 6cmx6cm and then cut that into four strips. Roll the strip of dough around the needle in a spiral, then slip it off the needed and place it on a floured tray to dry. 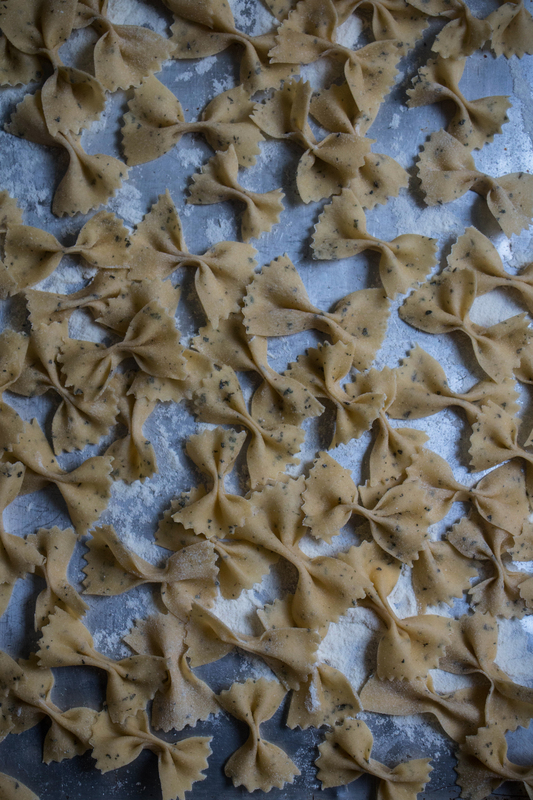 Farfalle – This is the beautiful bow-shaped pasta (below) and is one of my favourites to make, and goes really well with lots of sauces. The dough for that one had chopped herbs in it. 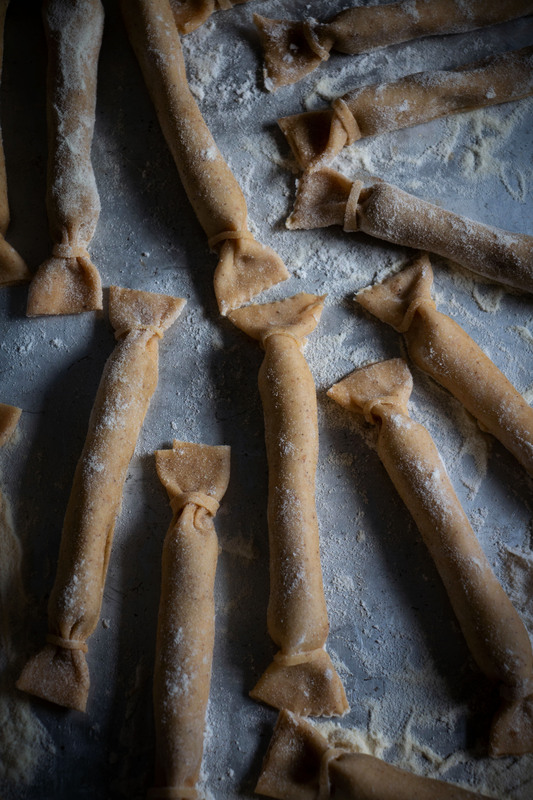 To make this you cut the pasta into rectangles using a serrated pastry wheel, then pinch the centre to create the butterfly shape, then place the shaped farfalle on a floured tray to dry out a little. It is a really easy shape to make at home, you cant really go wrong with it. 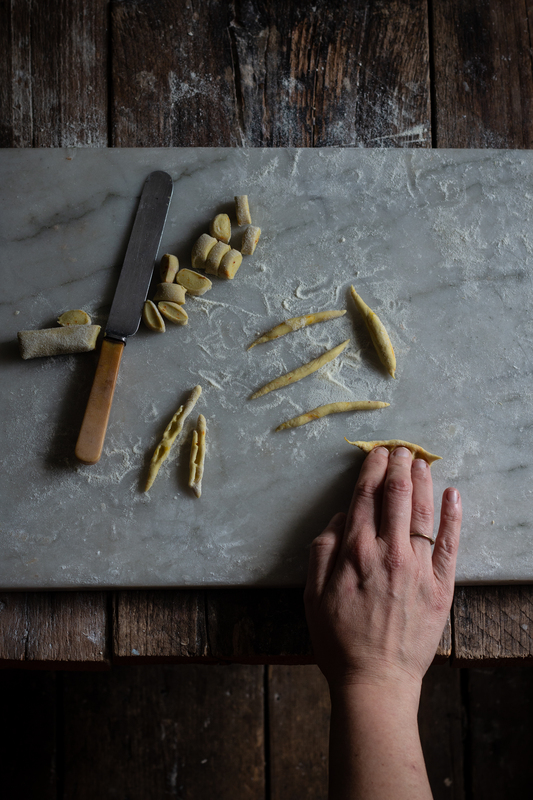 Garganelli – This one is a bit like penne (see below) , but larger and rolled, its made using a special wooden board that has indentations in it and a small roller. I picked up my roller really cheaply from amazon. 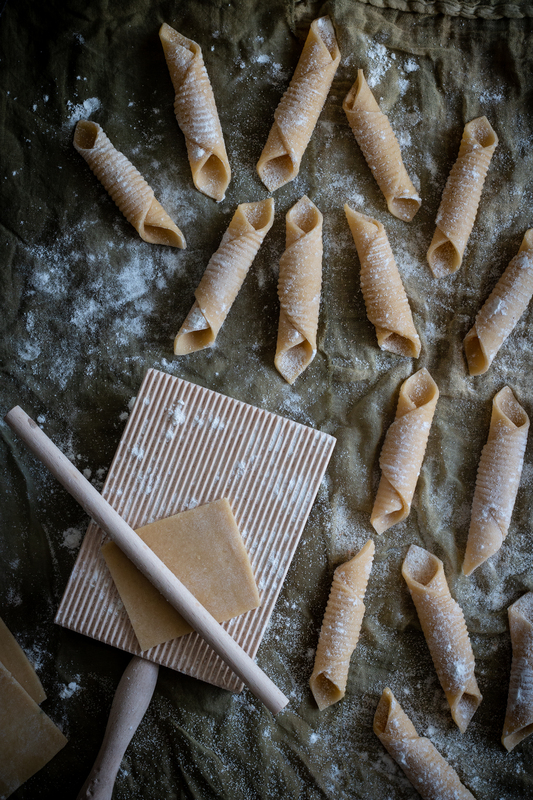 To make it you need to cut the pasta into 6 cm squared pieces and place a piece at an angle and roll up with the little rolling pin and slide off and place the shaped pasta on a floured tray. Maltagliati This is pasta that is cut into large oblong shapes with a knife or flat pastry wheel. I don’t have any photos of this one but its super easy and great in soups or stew like sauces. Just imagine flat triangle shaped pasta. 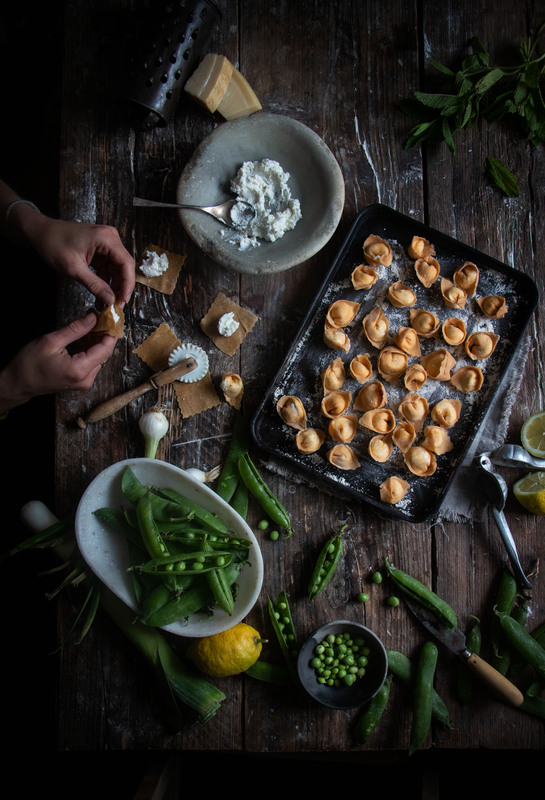 These are all little parcels of dough, stuffed with a filling of some kind, like little dumplings. 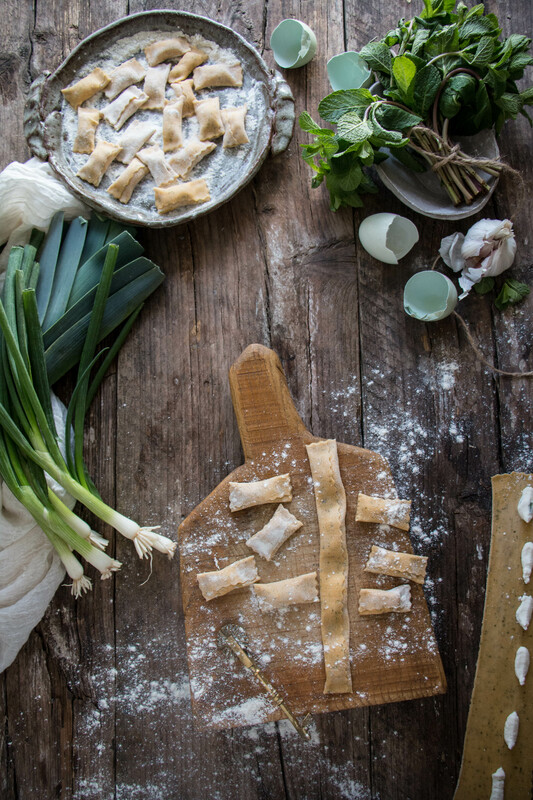 There are lots of different filled pasta you can make at home, and they come in all different shapes and sizes, this is just a few of them. 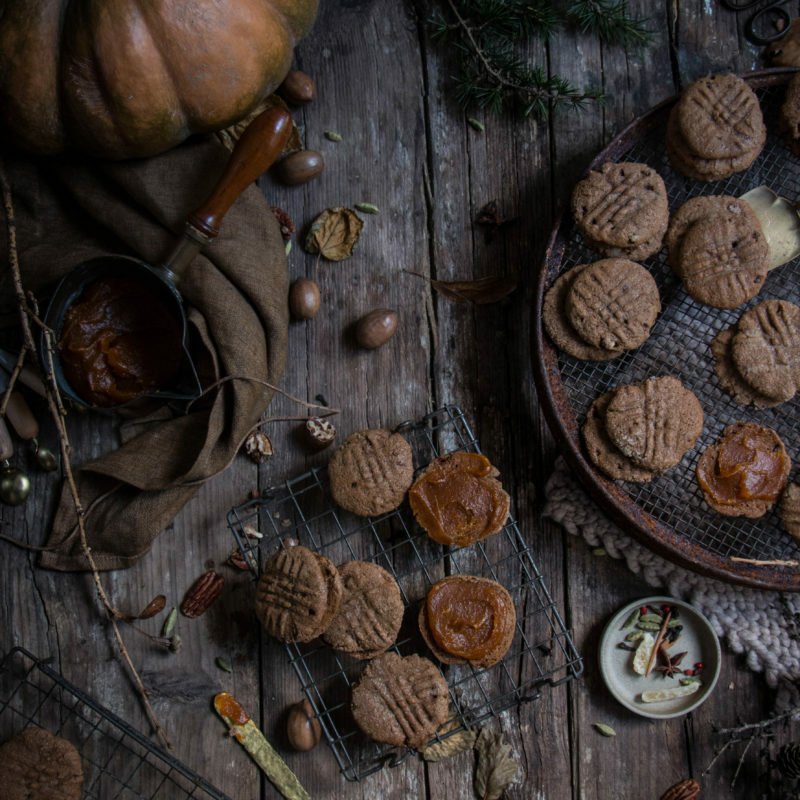 The filling possibilities are also endless, the most common filling tends to be a mixture of ricotta and parmesan but my favourite is pumpkin or meat. Raviloi are the most common, and very simple to make. To make them, roll out the dough into a long sheet and place the filling in little mounds along one side of the dough leaving a space in between each one. Then brush around each mound with water and fold the dough over and press down around the mound and press out any air and seal it and cut into squares using a fluted pastry cutter. You can also cut it into circles. 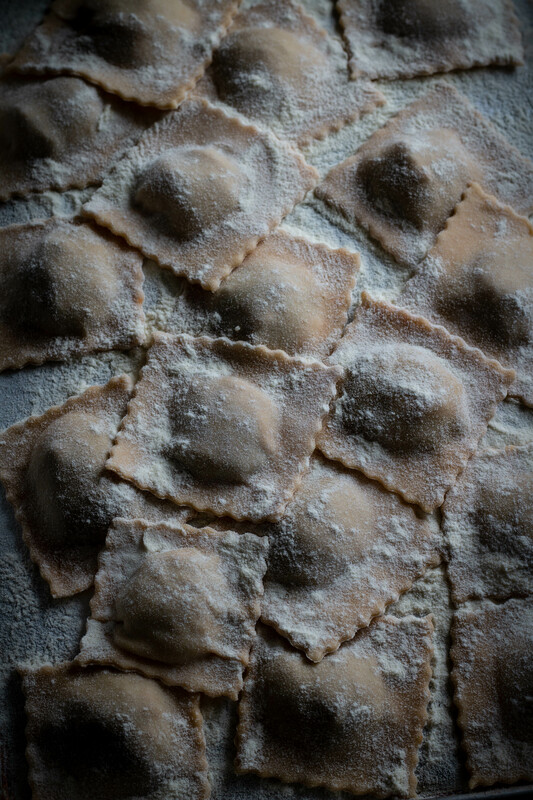 Agnolotti is another simple one, that is quite similar to ravioli just smaller and it looks like a little parcel. These are made with round cut pasta, for tortelloni use 6cm, or square and for tortellini use 5cm. 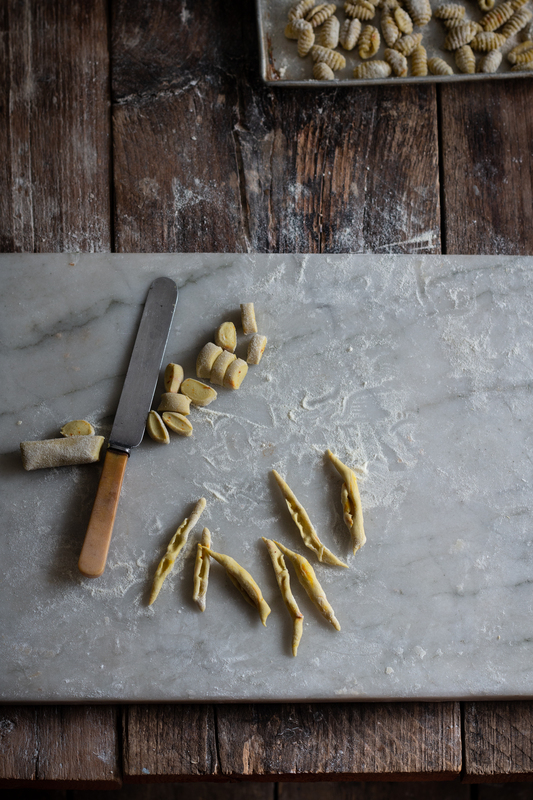 I tend to make all of these using a pasta machine first rather than a rolling pin. I have made it with a rolling pin in Puglia, but I just find the use of a pasta machine that bit easier. To see caramelle (candy shaped pasta) see my recipe here and a cracker shaped one here. The wonderful thing about making egg pasta is that there are so many options to adding flavours and colours. Not only does the colour look pretty but it also adds lots of flavour. Its great to do when you are having guests or just when you want something a little different. I tend to make coloured pasta when I have left over vegetables that need using up, so its a great way to combat food wastage. You don’t need a lot of an ingredient to colour the dough so its perfect. 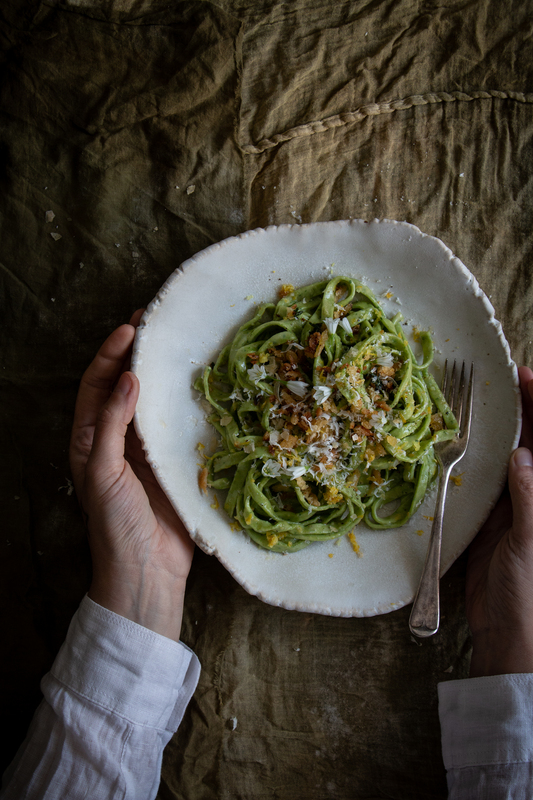 Green pasta is the one I make most often as I always have left over greens that need using, but using left over pumpkin puree in the autumn is also really delicious. 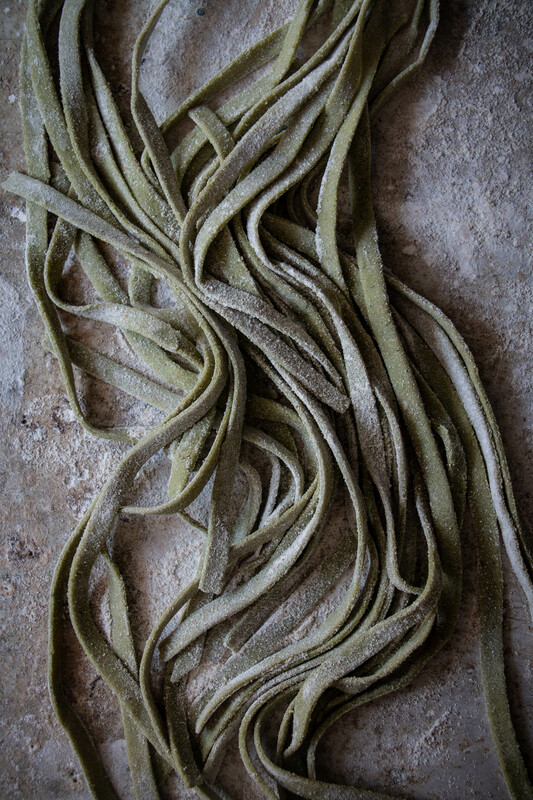 Green pasta can be made with spinach, nettles or wild garlic. To do this add 75g well drained, pureed cooked spinach or nettles. I like to use raw pureed wild garlic in the spring. Add this to the recipe above, leaving out one egg. Some people find this pasta is hard to make as there is too much liquid, this could be because the spinach wasn’t drained enough, I have found that if I puree the spinach mixture with the eggs and then add it to the flour it is easier to add more flour if I need too. 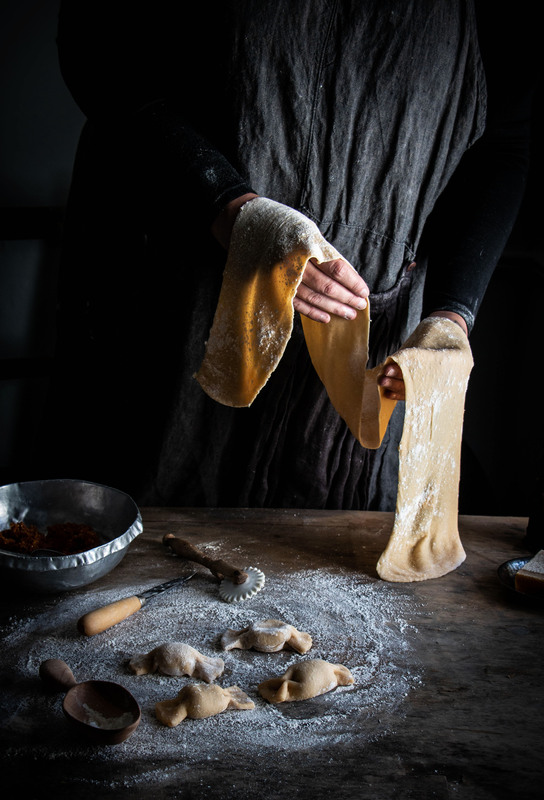 you can add flavours to pasta doughs too, like pepper, paprika, chopped herbs and even tomato puree. 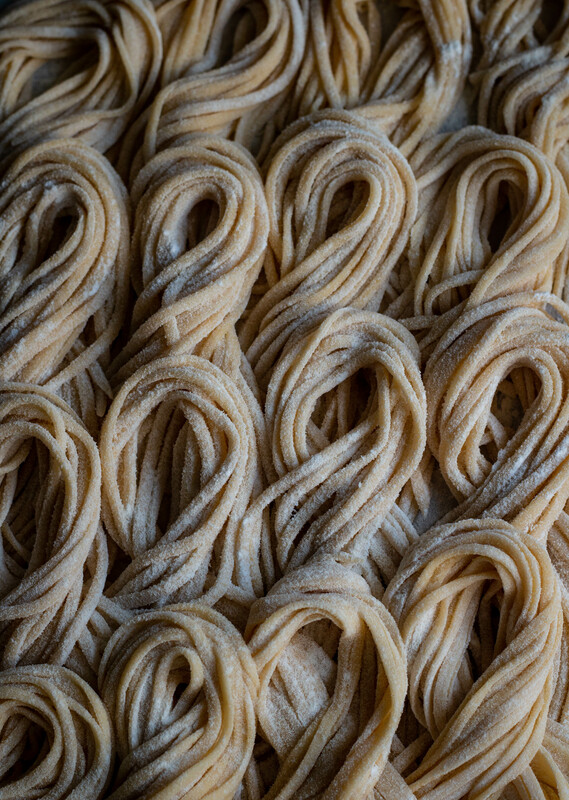 I love making this type of pasta, mainly because it is just so beautiful to look at. Its a great show stopper if you are cooking for guests but I just love making it for fun. Its almost like a work of art, you never know how it will look and each time its different. 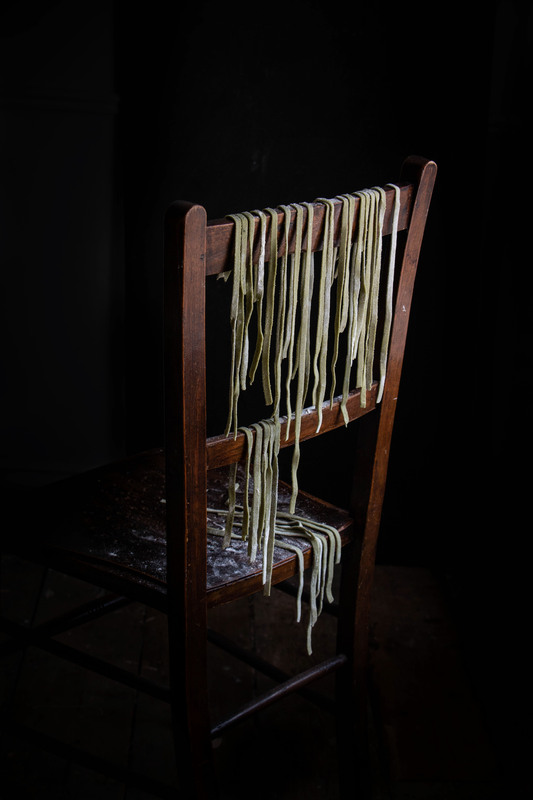 Not only is this pasta great to eat but its probably one of my favourite pastas to take photos of. If you follow me on Instagram then you probably already know that. I just make it for fun for my partner and I, and post photos of it quite often. 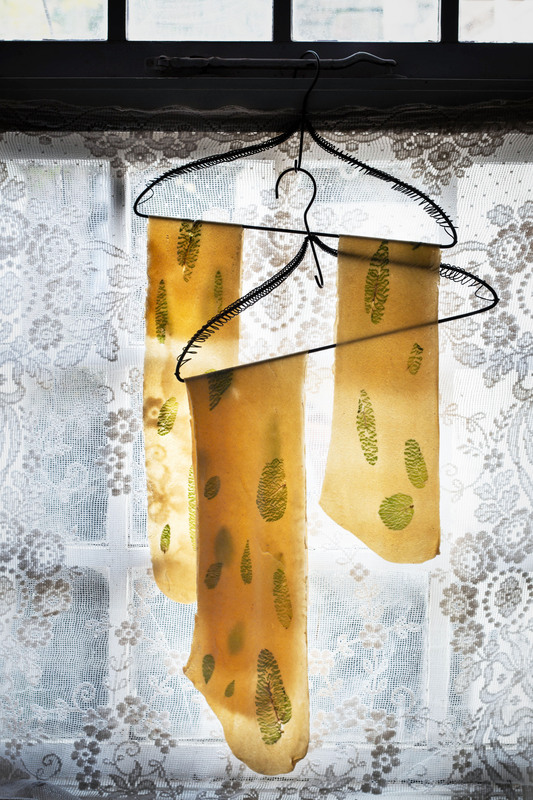 My pressed flower pasta photo was my most liked photo ever, so I think you all must like the look of it too. There are a few things to think about before you make this pasta, but overall its really easy to make. 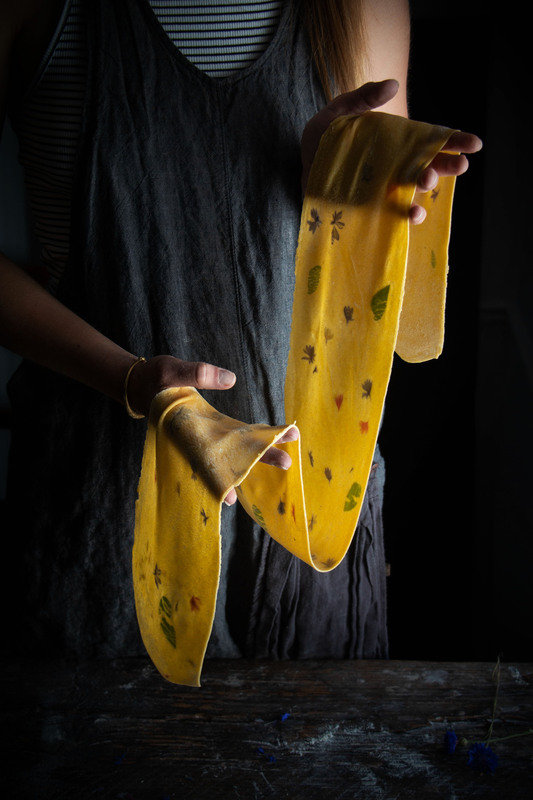 My top tip would be Choosing herbs and flowers with thin leaves, remember that its being pressed between two layers of pasta so the flatter and thinner it is the better. The best herbs to use are soft leaved herbs like basil, dill, mint, oregano. This is because the leaves are going to roll through the machine and stretch easily, and they are flat. Woody herbs like rosemary and thyme will tear the pasta dough so I wouldn’t recommend them for this. I have also made it with small spinach leaves which worked well. Cut the stems off any of the herbs first. 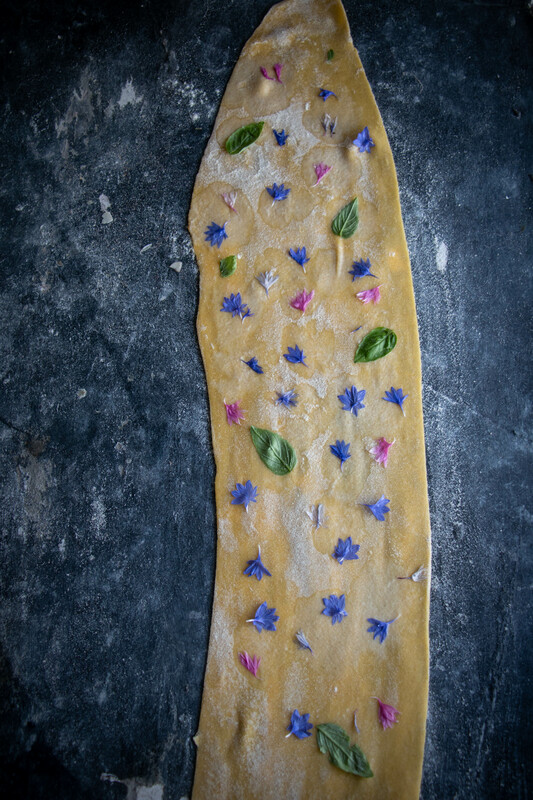 Flowers look so beautiful in the dough and make the pasta so colourful, and there are a lot to choose from. Pansies, violas, marigold petals, corn flower petals, dianthus, nasturtium, calendula and primroses are my favourite varieties to use, but other edible flowers are fine as long as the petals are thin. You can use whole pansies, primroses and violas if you carefully remove the stems, the other flowers I mentioned I tend to just use the petals. 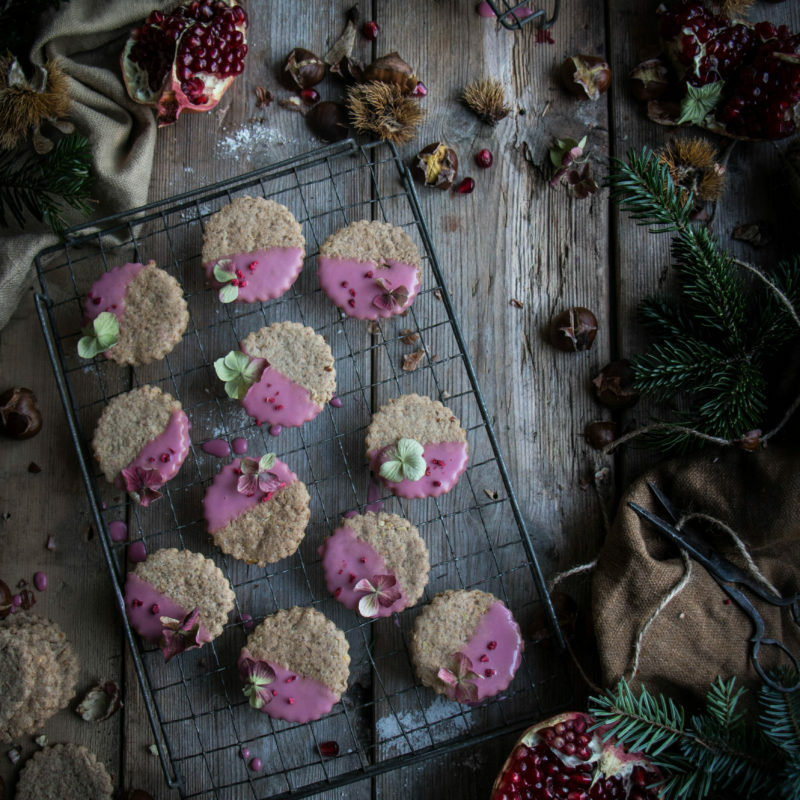 Herbs and flowers don’t just add colour but also flavour, a lot of edible flowers actually have quite a lot of flavour, some are really peppery which is perfect for savoury recipes. Make sure you use organic unsprayed flowers and herbs, I use violas and pansies most often as we have them in the garden, but you can order fresh cut edible flowers now. I use herbs from the garden or the supermarket. Roll out the pasta sheet to as thin as you normally would so you have a nice thin long sheet (number 7 on my pasta machine seems to be the ideal thickness for me, but your machine may be different so just go as thin as you can with out the dough tearing) then with a brush add a little water brush on dots of water where you want to add the herbs or flowers and press on. Space them out over half of the pasta sheet, remembering that they will stretch and change size and then fold the other half of dough over and press together. Turn the pasta machine back up to two thicknesses wider than the one it was last rolled through before you added the herbs/flowers (number 5 on my machine) and roll through, then turn it down to the next thickness and roll through again until it Is nice and thin. The herbs/flowers with break up and stretch with the pressure of being rolled so it can create some really amazing looking pasta. 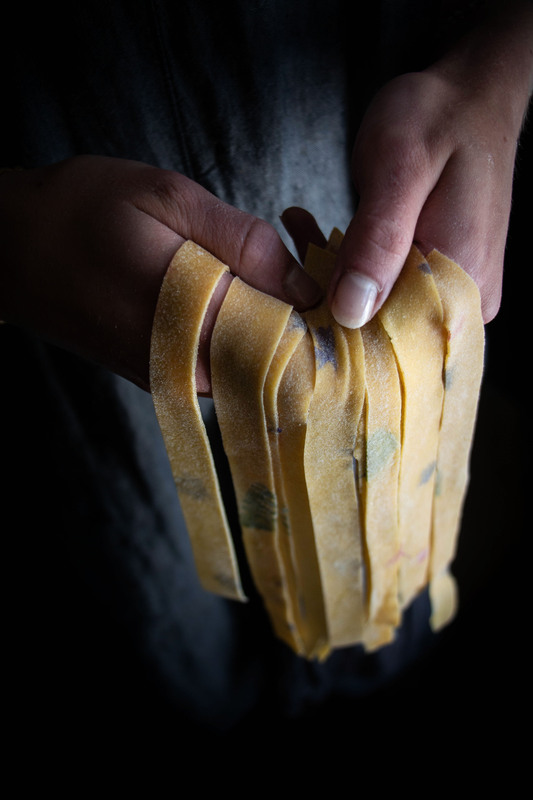 I love to use this type of pasta for ravioli and pappardelle so you can see the beautiful pattern. I have also used it for lasagne but it wasn’t really visible to the people eating it, it just added flavour. The only gluten free pasta I have made at home was chestnut flour pasta, so I don’t feel like I am much of an expert on the subject. So instead I am handing the pasta torch over on this one, here are some links to recipes for gluten-free pasta. I don’t add salt to the pasta dough, but instead I add it to the water I am boiling the pasta in. Boil a big pan of water, once it reaches the boil add salt. 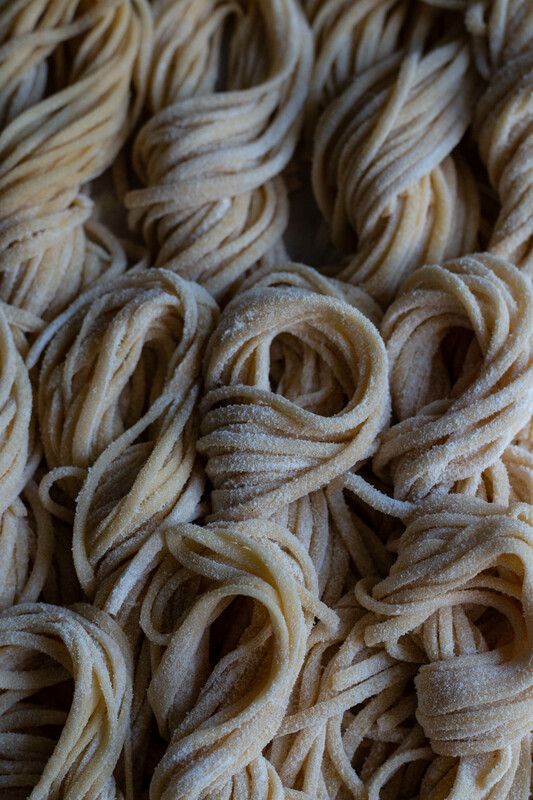 I use a few tsp of salt so the water would be quite salty to taste, then add the pasta and boil it for about 3/4 minutes – sometimes 4/5 for filled or long pasta. It depends on the type of pasta you are cooking. When it floats to the top of the pan usually around 3 minutes I try a piece. If it tastes nice and al dente its done, so drain it and mix it with the sauce right away. I like to have my sauce ready and waiting so that pasta doesn’t have to sit around and go stodgy, plus the starchy salty pasta water is great for adding into the sauce. I usually add a small ladle in to my ragu or tomato sauce to add extra flavour. This type of egg free semolina pasta is very popular in the south of Italy, but there are many varieties from all over Italy. I imagine that its probably the oldest pasta type in Italy. It is made with durum wheat semolina flour and water, Simple as that. I find something so satisfying about this type of pasta, the semolina makes it filling and chewy and every mouthful feels like a comforting hug. I know that sounds a bit corny but that’s exactly how I feel when ever I eat it. It seems to have powers that send me back in time and make me remember really comforting moments, that’s why I think its the ultimate comfort food . Its quite a heavy pasta so that’s possibly why I like it so much. 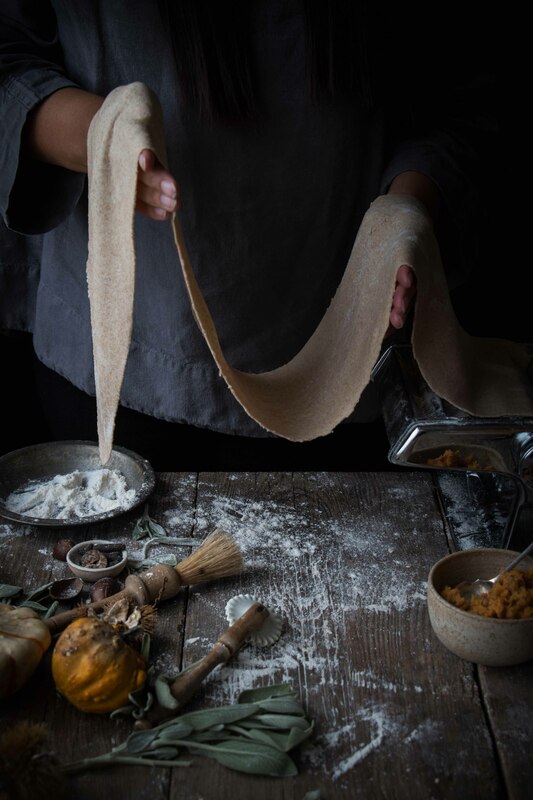 While my partner and I where on holiday in Puglia last year I had the pleasure of attending two pasta making workshops with the most amazing teacher. It was one of those incredible moments where I connected with someone else in such a special way. My teacher couldn’t speak English and I couldn’t speak Italian, but it didn’t matter as we communicated fluently with our love of pasta. It seemed like such a special moment that I will remember forever. 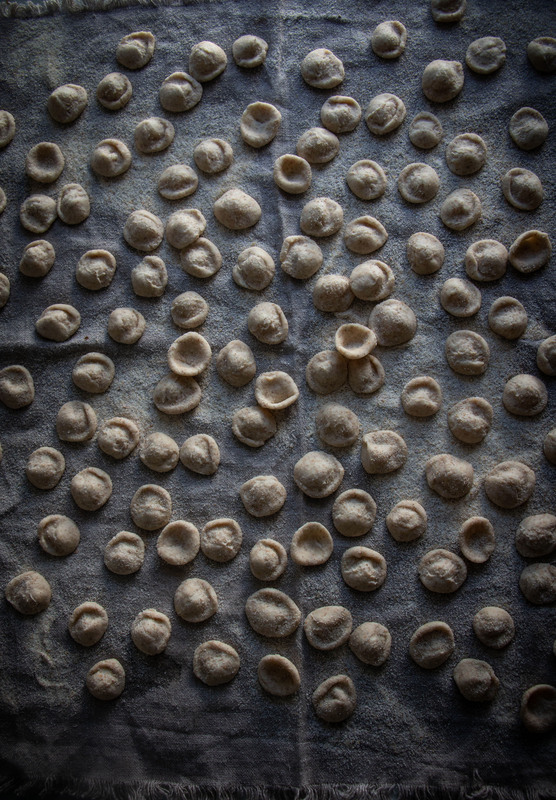 My favourite shape of semolina pasta is orecchiette, but it seems to be one of the hardest for me to master other than trofie. Even though I had those two pasta classes focused on this type of pasta, I still struggle and feel I’m not that good at making it look perfect. Once you have made a few you seem to get into a rhythm and it then seems really easy. Each time I make it the first 10 look terrible and then suddenly something clicks and they start looking like they should, so don’t be alarmed if you find it a hard shape to master too. This is another pasta that I would recommend you type into YouTube and watch a few videos on. Roll out the dough in long ropes and then cut off small bean sized chunks. Using the back of a flat blunt knife (I use an old butter knife) pull it over the dough with the knife at an angle holding on to the dough with one finger, then turn it inside out over your thumb. It sounds really complicated and hard to explain so I would suggest watching a few videos. Once you get into the motion of it you will find it really easy, I seem to struggle, maybe because I’m left handed, I’m not sure. 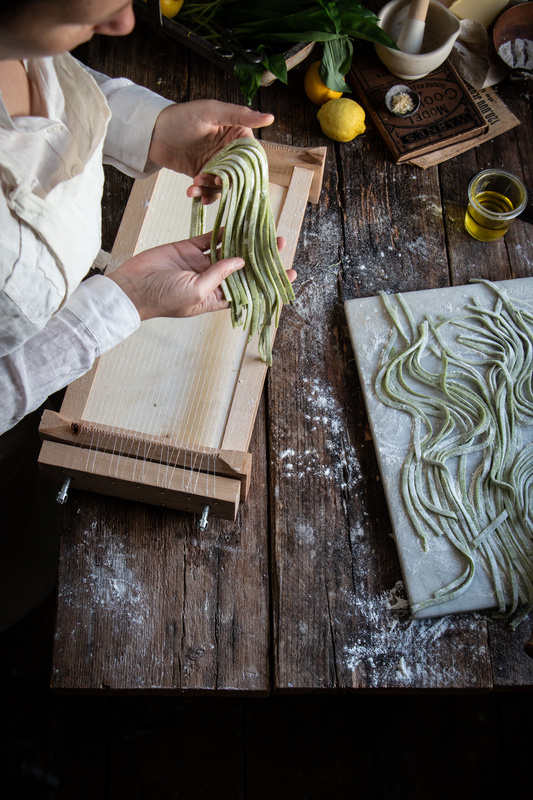 pici pasta, Pici is a Tuscan handmade pasta. It is made by pulling on a piece of dough made of durum wheat flour (usually no egg) until you have a lengthy string, its like a long worm. Pici is really fun to make, especially with children but its a bit hard on the hands and arm muscles. Basically cut off a ball of dough and roll it as long and thin as you can. I really love this pasta because its really chewy and goes great with lots of sauces. 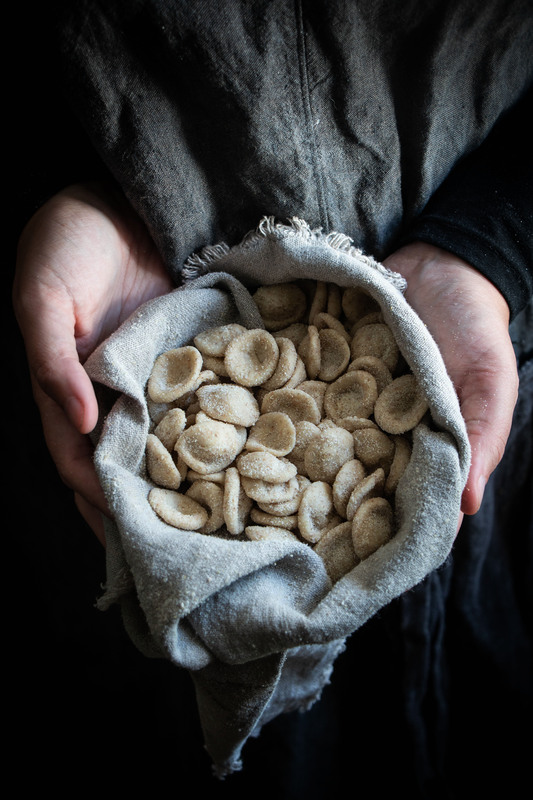 These are small chunky pasta shapes – concave with a ribbed back like a shell – they are made with pure durum wheat semolina, They are also known as ‘malloreddus’. I use a gnocchi roller or butter pat to make them, they are so easy to make, therapeutic almost. To make them cut off a small bean sized piece of dough and roll it down the gnocchi roller with your thumb so it rolls up. This one is a great one for beginners to try as you cant really go wrong. This pasta is typically eaten in the north of Italy in places like Liguria and it is normally eaten with pesto. 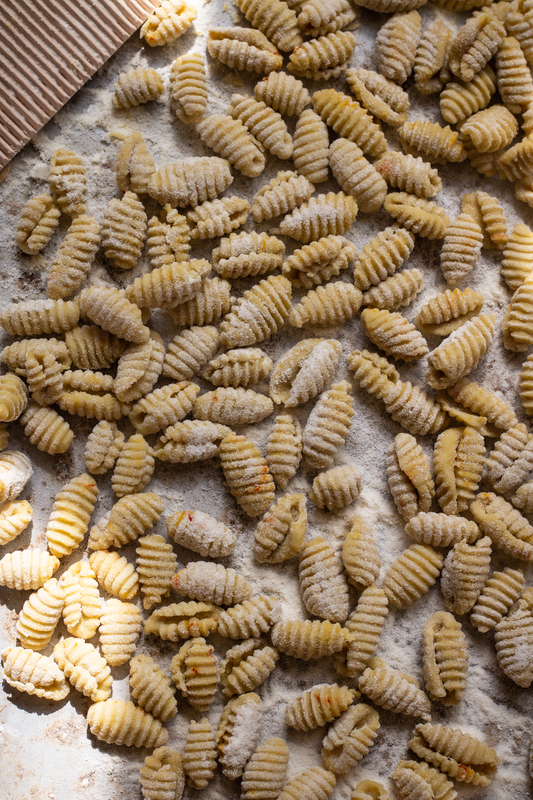 These little pastas are about an inch long, but they can be longer I tend to make them about three inches long. They are quite hard to make the traditional way with a knife rolled against them to make the spiral shape. I just roll up small flat strips. I roll the strips of pasta between the palms of my hand so they twist in the same way. I have watched a lot of videos on youtube on how to do it the traditional way with the knife and still have yet to master anything that remotely resembles trofie at home. I’m working on it. I find its best to add a little olive oil to the dough to make it nice and smooth. Coloured pastas can also be used as a vegan substitute by using extra puree. 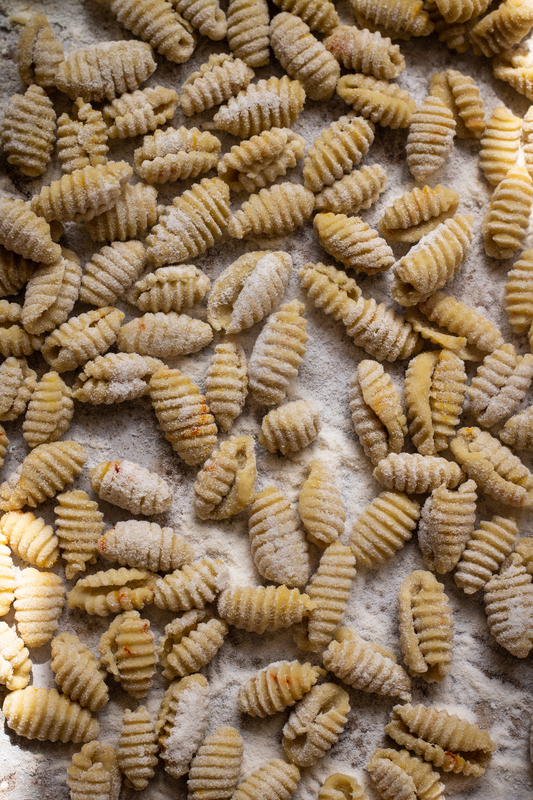 Semolina pasta sometimes takes longer than egg pasta, especially gnocchetti. Its cooked in the same way as the egg pasta above but times vary. I wait for it to float to the top.However Orecchiette only takes 3 to 4 minutes to cook. Pairing pasta with sauces is another big consideration, its thought that certain shapes go best with certain sauces. Generally its said that the smoother the pasta the thinner the sauce, and the rougher the pasta shape the thicker the sauce. Most of the shapes invented were created as a way to hold the sauce in the best way. Regionally in Italy the pairings of sauces and pasta shapes vary, you can use a meat, or vegetable based sauce, a cream or cheese sauce, a pesto or the simplest a delicious butter sauce. I’m a meat sauce/ragu kind of gal, I could eat it all day every day, There is something so satisfying about slow cooking this sauce, the house smells incredible and the labour of love is always worth it. The word ragu comes from the French word ragout, meaning well seasoned stew of meat or fish and vegetables. Ragu alla Bolognese is my favourite and it must be eaten with tagliatelle and not spaghetti, pasta with more edges is the trick here so I have often had it with other types of pasta too. Of course I’m British and spaghetti Bolognese is a staple here so I have had it with spaghetti too, many times. The people of bologna would not be happy about that, the same way that some would say you should not have cream or parmesan with fish pasta dishes but I do that too, it’s all about what your personal taste is. heres another one of my favourites, Tuscan chianti braised beef cheeks and pici. I was lucky to have some great hand models for some of these photos. The beautiful blonde in the first few shots is Megann Evans who helped at a workshop in Australia last year. Other than my hands which feature a lot, I had the help of the lovely Solenn, Silvia, Kimberly and abi. I love to photograph hands at work. I’m having my husband read this post from start to finnish, seeing he’s the pasta maker here. So many good tips, so much yumminess here!!!! such a fab post Aimee! so much detailed and useful information, I literally can’t wait to make a batch of fresh pasta now! This is so epic! I can’t stop staring at all these glorious photos.